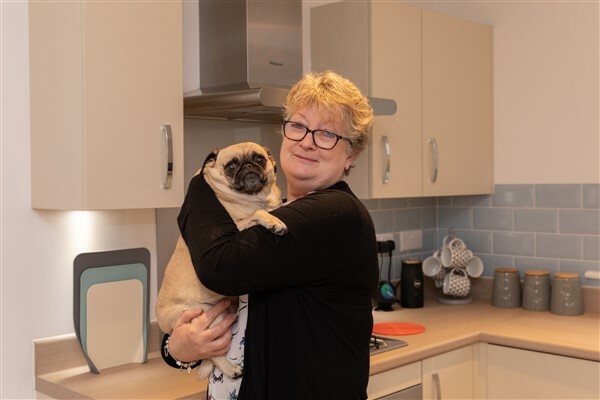 Looking for a change of scenery, and after hearing about her son and daughter-in-law’s great experience with Bovis Homes, Corinne Bowler discovered the housebuilder’s popular location in Shinfield. The retired police officer moved into her new home at Shinfield Meadows at the end of last year and has been delighted with the service she has received. Corinne, who was living in Lower Earley at the time, initially looked around Hatchwood Mill in Winnersh, but knew Shinfield Meadows was the right place for her after visiting the new neighbourhood. “Shinfield Meadows is perfect. It is close to work and it’s also easy to get onto the M4 to visit Tim and Lydia and my daughter, Sam and her partner Simon in Hampshire,” says Corinne, who has swapped the beat for the bean and now works in a restaurant as a front-of-house barista. Corinne was looking for a home with a garden for her two dogs, Frankie and Kiki, cat Rocky, as well as space to accommodate her family, who would be regularly visiting. The Epsom has a spacious sitting room which leads through to the dining area. There is a stylish fitted kitchen and a master bedroom which includes an en suite and a built-in wardrobe. “My new home is great! I love that it is so light and airy, with big windows and French doors leading outside. It is a very good size for a three-bedroom property – especially as it has an en suite.” says Corinne. The sales team, Candy and Todd, helped Corinne find her ideal home and guided her through the buying process, while site manager, Lee, oversaw the construction of the property. “The service I had from Candy, Todd and Lee was gold standard – nothing was too much trouble for them and even now this continues.